Let the “Bah Humbugs” begin! We are giving you fair warning. Holiday decorations will be installed beginning this weekend so that we are ready for the first Terrific Thursday event on November 6th. After last year’s debacle, we are working with a new company and have purchased a supply of new wreaths to mix with some refurbished older ones. Trees around the square and the planter islands have lights installed and other new surprises have been added to help us light up the nights around Decatur. 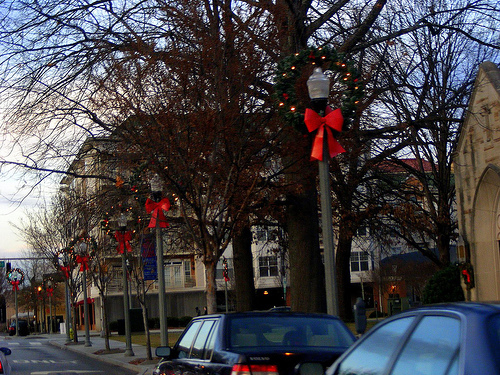 In most areas downtown, wreaths will installed on every other pole. 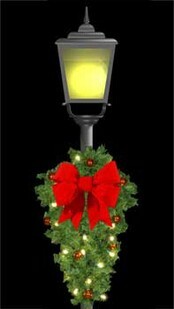 Next year we’ll add more new wreaths so we can expand coverage and include all of the new street lamps being added in Oakhurst and at the new downtown developments under construction. So grumble if you have to but we hope you enjoy the magic created by holiday lights as the temperatures tumble and the nights grow longer. Monday, Dec. 23 and Tuesday, Dec. 24 solid waste and recycling will be picked up on the regular schedule. The City will be closed Wednesday, Dec. 25 & Thursday, Dec. 26 so regular solid waste and recycling for both Thursday, and Friday will be on Friday, Dec. 27. New Year’s Day is on Wednesday, Jan. 1 so there are no changes to the regular solid waste and recycling schedule. Sometimes New Things Just Don’t Work! OK, we agree, the new holiday decorations don’t measure up to our standards. Rather than looking like swags, they look like upside down trees and they just don’t work on the street lamps. Many of our holiday wreaths date back to 1996 and were starting to look shabby. We thought it would be a good idea to trade them out for something different and replace the oldest wreaths with an updated design. Boy were we wrong! So, when you mess up, admit it, take responsibility and fix it. The good news is that our old wreaths are still in storage. Our decorating company will begin switching them out but it may take a week as they fit us into their installation schedule. The “experiments” will be traded in for new wreaths next season and we will put this down as a lesson learned. In the meantime, just tell your friends that they are festive arrows pointing you in the direction of great shopping and wonderful food and have a very Happy Thanksgiving! If you’re looking for the City of Decatur’s Decatur Minute blog, please visit www.thedecaturminute.com. Please make sure to update your bookmarks from thedecaturminute.workpress.com to www.thedecaturminute.com. Decatur Old House Fair this Saturday! Its time for the Decatur Old House Fair again! In its 5th year, this event is a one of a kind event in the Southeast and offers owners of historic homes the chance to learn from experts on all sorts of old house issues like basement moisture, restoring historic chimneys and fireplaces, energy efficiency, and tax credits for older homes. In addition, we have our short bites and style bites (30 minute sessions) that will explain electrical, plumbing, wood floors, aging in place along with delving into styles of homes like Craftsman, American small, American Foursquare, and Ranch. So many sessions with so much information! The event is this Saturday, Feb 2nd from 9 am to 4 pm. Tickets can be purchased online at www.decaturoldhousefair.com and they are $10 in advance and $15 at the door. Today is the last day to take advantage of the Living Social Deal-buy one get one free. So, don’t wait! Go to https://www.livingsocial.com/events/569782-2013-decatur-old-house-fair-tickets and score your deal! If you are running out of ideas for home cooked meals, Universal Joint in Oakhurst just posted on their Facebook page that they have some new, limited-time menu items right now. Marinated hanger steak with garlic mash and mixed garden vegetables. Blackened chicken with penne past and tomato basil cream sauce served with ciabatta garlic bread. Fried pork chop with garlic mash and mixed garden vegetables. Also just put on tap Decatur’s own Blue Tarp Brewery. We’re pouring their Bantam Weight, which is their irish red ale. I don’t know about you, but they had me at Ciabatta Garlic Bread!